The Green Jersey was dominated by Marcel Kittle until he crashed out in stage 17, Michael Matthews took over the green. It didn't take long for Chris Froome to reclaim the Yellow which he did whilst putting in some extra time into Fabio Aru who was starting to struggle. 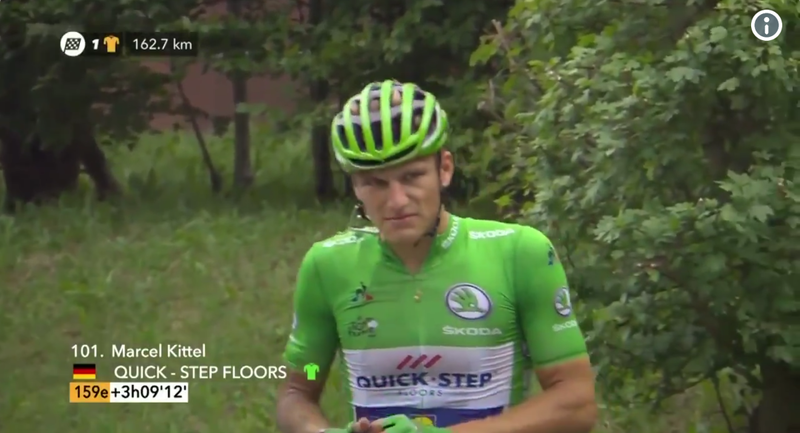 The only one not losing time to Froome was Rigaberto Uran. Barguil ruled in the mountains. 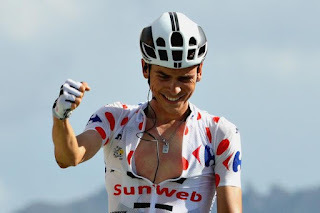 Warren Barguil reaffirmed his dominance in the Polka Dot Jersey stakes with some impressive riding in the Alps. It was great news for his team, Sunweb who also had Matthews in Green. The penultimate stage was an individual time trial with a potential to shake up the GC (general classification). The start and finish was hosted in Marseille's football stadium. 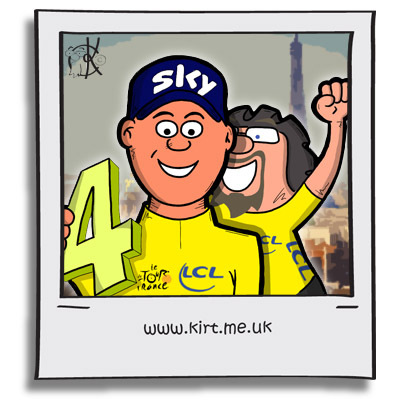 Chris Froome came 3rd and guaranteed his place in the Yellow Jersey in Paris. 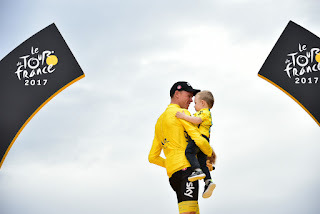 Froome enjoys the podium with his son. The final stage is always a spectacle with the celebratory procession into Paris. However once the riders get to the Champs Elyssee the racing starts. It's a sprinters dream to get a win here! In the end it was Dylan Groenewegen who took a surprise sprint victory on the Champs-Élysées ahead of André Greipel. So Chris Froome took the glory and a 4th overall win. Chapeau!